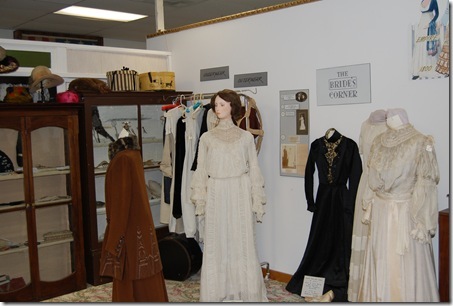 A while back, I was approached by a local museum about helping them with their textile collection, specifically the clothing. I demurred at first – I work on quilts, not clothing, and know little about managing a museum collection. With persistent encouragement from my “recruiter” and in recognition of the fact that a formally trained museum conservator isn’t likely to wander by and volunteer her services, I finally agreed to take this on. 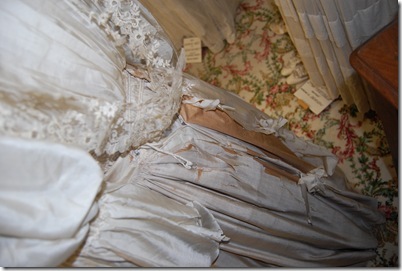 Some of the dresses don’t look like they’re in bad shape… until you take a peek behind. And, just like in crazy quilts, old silk splits and shatters. Packing tape is NOT a recommended method for stabilization. This project is rather daunting, but I think I’ve come up with a game plan that will help me to eat this elephant one bite at a time — over the next decade…or two. My first priority will be to remove surface dust and then place most of these dresses into storage until I can work on them. 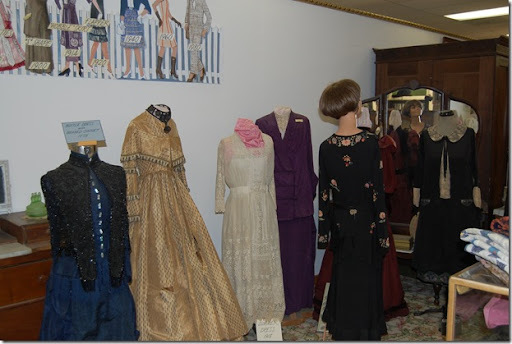 I’ll be creating couple of new exhibits using textiles that have been in storage, along with reorganizing some of the standing displays. 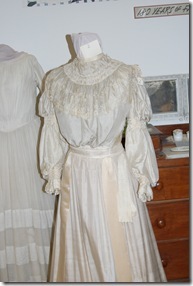 Oh, and emptying out the Amazon.com bookshelves on the subject of costume display and history. I’m still in the brainstorming stage, so if you ever had a burning question about or interest in clothing (1850’s – present), here’s your chance to share your thoughts! Previous The headline kind of says it all. Next Babies in the barn! not an area I know or want to explore, but there is a world class museum here in town (website http://www.costumemuseum.com/ who might have some useful insights on the way forward or “do and don’ts” 🙂 Good luck! You are definitely to be commended for accepting this project. It will be a lot of work but I envy you being able to work with the dresses. 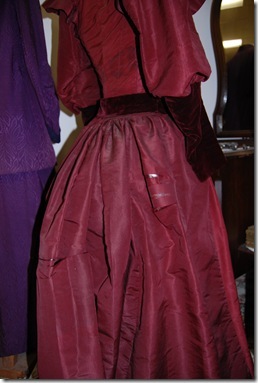 I live in an old gold rush town and have thought about making myself an 1850’s dress to wear to our town’s celebrations. I’ve always wondered exactly what ladies wore in the gold towns. I will be interested to see what kind of dresses you have from that era. The dresses in the photos look lovely even though they have problems. 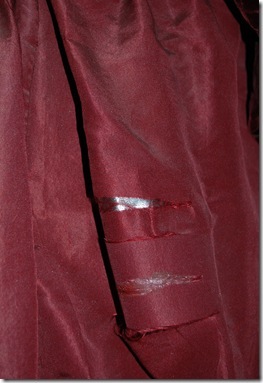 Shattered silk……can you contact the Smithsonian? What a disaster the fabrics of those dresses are.